Spoiler Alert: I built this post on a plot twist in the great new Pixar/Disney film Inside out, which, though predictable, is moving and deserves a spoiler alert. Also, I didn’t do much plot summary, so this might not make a ton of sense without seeing the film. From the moment our Pixar guides introduced the valley of forgetting, where memories pass into oblivion, moments lost, buried forever beneath the tyranny of the present, I knew Bing Bong would end up there. Call it Chekhov's pit of cognitive purge. You don’t foreshadow the violence of forgetting unless someone's gettin’ forgot. But seeing it coming didn’t change the weight of it. 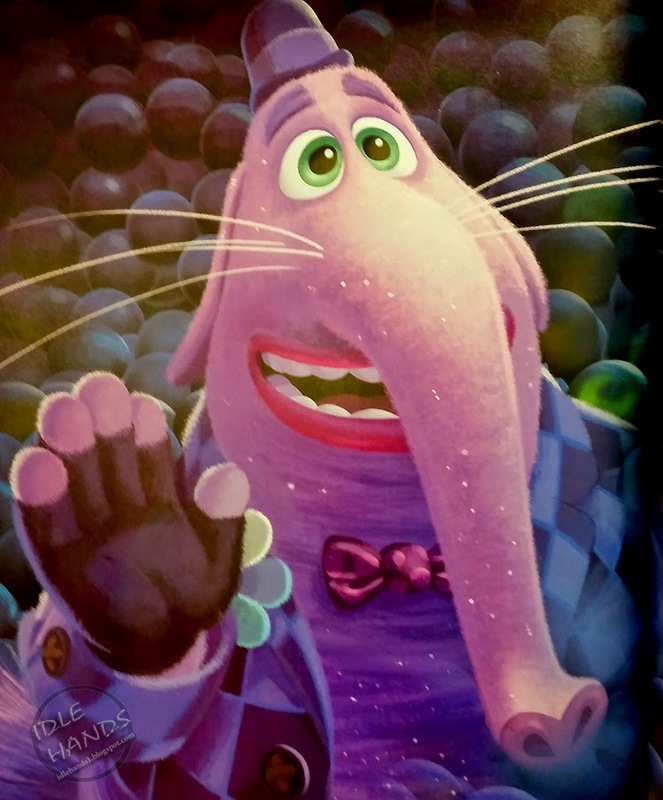 When Bing Bong’s face changed, resigned courage rising in his twinkling pachadolphin eyes, just before he lets go, falling into the pit of unbeing, sacrificing himself so that Riley could literally get Joy back, the theater gasped. But no one over 12 gasped for the surprise of it. We gasped under the weight of it. A beloved companion, unkindly cast aside, offers the one last thing he has to give to save his beloved friend, himself. Now, I get that Christological types are tired..and this one is decidedly imperfect…but three days later,  I realized I’d heard this story before. A beloved companion, guide, and source of wonder from years of innocence, steadfast in his love, finds himself cast aside and marginalized. He finds his beloved in trouble, battered by her world and loss of wonder, and instead of bitter “I told you so’s”, he casts himself into oblivion, whatever lays at the other side of forgetting, trading his life – and in a mysterious way, his very ontology – to vouchsafe joy. He trades himself for his beloved’s joy to rebuild her crumbling identity and moral lostness. I’ve heard this story before. But unlike candy/elephant/dolphins, oblivion could not hold Jesus. He breaks the monotonic trajectory of forgetting, offering us the same escape from the valley of unknowing that he forged, an ontology that surpasses whatever ephemeral marks we make on human memories. This deserves its own post. The primacy of future memory in our choices is a really interesting idea, highlighted by the great section in Kannaman’s book (TFAS) where he asks, “Would you accept an all expense paid one week vacation anywhere you’d like if you would not remember it when it was over?” He argues we have two selves, an experience self and a remembering self, and disentangling their motivations helps us understand our always complex, sometimes counter intuitive, and often self destructive choices. The pit of final forgetting leaves us with the question: Do forgotten things matter? Are the only relevant actions remembered actions? The answers to these questions tell us a lot about celebrity culture and our own aspiration. Bing Bong was Riley’s obsolete imaginary friend, found wandering the halls of her long term memory, defined by his love for her and his recognition that she no longer considered him. The same night I watched Birdman in a sublime family movie night/reading group movie night* double header – which does the whole “Checkhov’s gun thing’ so heavy handedly that it was surely ironic. *My friend Kyle doesn’t read fiction, so when he came up in the draft order to select fiction** he picked a film. **We have changed our reading group format. Now we have a draft order and whoever is up picks unilaterally from whichever of our three rotating categories (fiction, theological non-fiction, secular non-fiction) is up. This new format has been wildly successful in my opinion, giving us a wide range of books we wouldn’t otherwise read instead of familiar stuff we can all agree on a priori. Incidentally, I’m assuming that it was the elephant/dolphin portion of him that made BingBong’s song/weight ratio sub-optimal, because a creature made largely of cotton candy would be pretty light. And I go there often, incautiously and unrepentant. Feel free to go ahead and comment about Jesus being an ‘imaginary friend’ if, you know, you’re a troll. Poetic timing for the reappearance of one who resigned himself to oblivion to redeem joy.